I probably would not have considered making an apple dessert when I have two big quarts of greenmarket strawberries in the kitchen, but then Jessica of My Baking Heart selected Dorie’s Parisian Apple Tartlets for TWD. I’m actually glad she did, because I am in love with these little tartlets! They are so simple (and pretty, too, I think)…a round of buttery puff pastry, topped with half an apple, then dotted with butter and brown sugar…c’est tout. Using good-quality store-bought puff makes this one of the quickest and easiest desserts to put together. In the oven, the apple turns soft, the pastry turns crisp, and the whole thing gets sweetly caramelized. The best part, though, has to be the center of the puff pastry– the part the apple had been sitting upon. It absorbs the brown sugar and the juices from the apple, and is indescribably yummy. For the recipe, see Baking: From My Home to Yours by Dorie Greenspan, or read My Baking Heart. Don’t forget to check out the TWD Blogroll! They look delicious and caramely! Yum! I love how simple these were to make too. These little tarts look fabulous, and so easy too! Oh, I agree. Easy and indescribably yummy! I’m in love with those tartlets too – they’re exquisite!! Wow those are beautiful! I ended up cutting squares from my sheets, I love how yours looks, PERFECT! Perfect! Yes, it is a quick and easy dessert. Unfortunately mine bombed. Your tartlets look perfect! I wish I’d added extra brown sugar during the baking. Your tartlet looks absolutely scrumptious, you’ve got me craving one now!! Vibi– No direct French genes, but my mother did live in Paris for several years before having me, so there was definitely a French influence at home! She would love this dessert! So, so adorable. It’s golden and fresh from the oven. Loved it! Yours look amazing. Perhaps you could try it with some of your lovely strawberries…. Nicely put. Your tartlet looks brown and bubbly and super incredible. Oh Steph, I just love your photos, and don’t you just love how easy this weeks little palm sized surprise turned out? Fun fun fun and oh I loved the middle too! The tartlets look fantastic. I loved this one too. Your tartlets look fantastic! I’m with you – this one was perfect, so simple and delicious! oh snap these are gorgeous. they really carmelized up nicely! well done. Easy and delicious. Just doesn’t get any better than that. Yours is lovely and the photo rivals Dorie’s. Perfect! I saw someone actually made the tartlets with strawberries, too. I need to go get some puff pastry to make these! I am with you sister. I am in LOVE with these tartlets!! I can’t wait to finish my two off tonight. Yours look perfect. Yours look so great! Did you see the ones made with strawberries? They looked divine! Yes, I saw the strawberry ones. They were so cute! wow, yours look like some of the most tantalizing tartlets i’ve seen today! tartlet is the cutest word ever. i will totally make this when apples are in season! You are so right..the best part is the pastry that has been soaking up the fruit juice! You’re making me crave another tartlet! 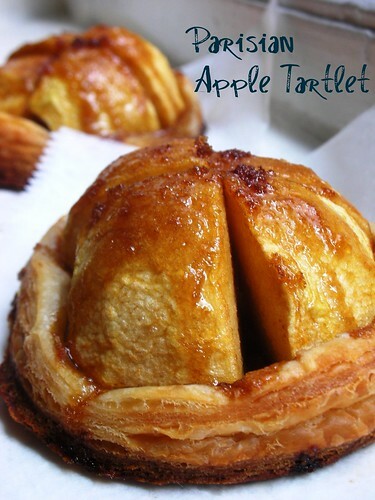 Wow, your Parisian Apple Tartlet looks fantastic – just like the picture in Dorie’s book! How in the world were you able to get the sugar to carmelize soo nicely? Just beautiful! Ooooh yum! I love apple desserts and this one looks absolutely scrumptious. Delicious! Your tart looks fabulous! I agree with you 100%! The best part was the center under the apple bits. So brown sugar pastry yummy! I couldn’t have said it better. Beautiful picture as always. Great job! This looks absolutely delicious. The pastry looks so flaky and golden brown. They are like little right side up tarte tatins. YUmmy. Spectacular! You got such a beautiful glaze over the apples. These are gorgeous! I loved that they were so easy yet so delicious! These are so cute! I love the shapes and I bet they tasted so indulgent! I think your tarts look fabulous! I love your the look of your site, and your photography is stellar. It’s a pleasure to be back.